I receive emails all the time from Christians who have finally seen the true light of the Gospel and left their apostate church. As painful a decision as that is, what follows is not always reassuring as there simply is a dwindling amount of churches that are not poisoned by the purpose driven church, theories of seeker friendly church growth and the plethora of false theologies that have gone mainstream such as nationalism worship, prosperity, word faith and experiential Christianity. What is one to do beloved when faced with the prospect of doing the right thing and still seeing no way out? I think the first thing we need to do is understands the situation and the times we live in. The Bible says narrow is the way to eternal life and few are those who find it. Few beloved. Not stadiums filled with people. Someone recently asked me about Hillsong and my answer was that I really do not believe you can have a ministry followed by millions of people and not compromise the Gospel. Jesus said He did not come to bring peace but a sword that would divide family against family. The Gospel offends by nature. It is exclusive by nature. Then we have the reality of apostate church. The Bible does not promise a great end times revival but rather a great end times falling away. We are living in the middle of that apostasy right now. What was anathema decades ago is considered acceptable doctrine today. Absolute heretics like Bill Johnson, Jennifer Leclaire, or Joel Osteen are revered within the church. Joseph Prince, Brian Houston, and TD Jakes? Considered mainstream! How many people in church point to the fact that a huckster like Paula White is the spiritual advisor to the President of the United States as a positive development for the church? The key verses today remind us that Paul warned us about the apostate church when saying goodbye to the elders at Ephesus. What we need to learn from these verses starts with the fact that the wolves that run the apostate church are fierce. Fierce means intense and aggressive. Our enemy does not play beloved. The key verses say clearly they will not spare the flock! I am saddened and amazed at so many people who criticize discernment ministries who are overly concerned about the wolves with seemingly no compassion for the sheep. The next lesson from the key verses today is that these wolves arise from amongst us. This is how they so easily gain a foothold. We see it every day that seemingly solid preachers and Christian leader start to veer towards the purpose driven path or embrace one of the popular heresies of the day. The temptation for the average Gospel preaching pastor must be monumental. To see all of the churches around him grow and grow. Riches upon riches. 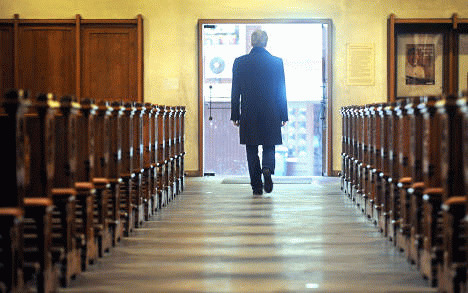 Pastors gaining in popularity, prestige and pay. It is then that they must pay attention to what it is that they are preaching. The key verses promise us that the false will twist what they preach in order to draw disciples after them. What better way to describe the cult of personality churches we see across this world today. People not following Christ but instead following the pastor. Then all of the compromised pastors hold hands and sing unity. Suddenly those that dared to leave their churches are the bad guys. Those that continue to point to the Bible are labeled legalists or "religious." One such Christian leader that seems to have gone off the rails a bit lately is J. Lee Grady. Mr. Grady used to a lonely voice of biblical reason on the heresy island that Charisma News has become. Unfortunately, bad company corrupts good character. He wrote a piece today that I hope was well intended but missed the mark regarding unity. Let us review and reason together beloved through the article linked above. I agree with Mr. Grady that everyone should have the ability to know when to miss a week at church. I am afraid our agreement ends there. I do not know any sheep that have left the sheepfold because sermons were too long or the music too loud. I am sure outlier examples exist but the majority of people who fit this bill are probably unsaved. If they then feel they can practice faith solo, it only goes to show how poorly they were taught. I am with Mr. Grady 100% that we were meant to be in Christian community. The problem is when that community abandons the Gospel.